It’s time to do a thorough clean-out of your pots and pans to check for scratches in the surfaces, especially those favorites you’ve had for years. 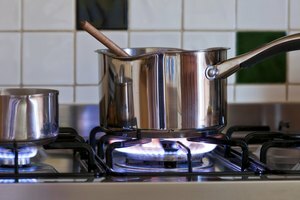 Thin, metallic and probably suffering from a dent or two, less-expensive aluminum stove ware poses risks to your health. Even more costly cookware has come under scrutiny, but research has found that a hard-anodized surface is safe. One of the more popular brands, Calphalon has passed the “risk” test and continues to score high on consumer tests. The history of Calphalon began in Ohio in the early 1960s as the Commercial Aluminum Cookware Company, a cookware producer serving the food-service industry. During the same period, an aerospace company came up with a process to strengthen and prevent the corrosion of aluminum, which they named “hard-anodizing.” In simple terms, they electrocuted aluminum! Recognizing the benefits of a stronger aluminum product, the stove ware company adapted the process for use in its professional line of cookware, and Calphalon was introduced in the company’s professional line in 1968. While aluminum conducts heat quickly, it also leaches into food as the surface deteriorates. It also pits when acidic foods such as tomato sauce come into contact with the bottom of a pot, exposing the food to aluminum residue. Hard-anodizing aluminum places a barrier between the aluminum and the surface, creating a non-scratch, non-porous, non-stick durable surface with a long life. Calphalon’s product line contains PTFE in its surfaces, as does Teflon. However, if the cookware is maintained correctly, the product is safe and non-toxic, and no exposure to PTFE occurs as a result of cooking in it. In response to customer demand, however, in 2013, Calphlon introduced a ceramic-based cookware containing no PTFE or PFOE. Every cookware manufacturer has its pros and cons, and deciding which one to buy is a matter of what you, the cook, like. Are the handles riveted onto the base? Are they long enough to give you leverage when lifting? Is the pot or pan too heavy for your strength? Like choosing a piece of clothing, selecting the right cookware is a personal choice that depends on how it fits you. As for durability, Consumer Reports rates Calphalon as “very good” for its price range, and it can be used on all cooking surfaces, including induction. Giving an “even cook” without hotspots, they are also heat-resistant up to 500 degrees Fahrenheit, so you can sear on your stovetop and finish in the oven without damaging the cookware. For the best value, buy cookware sets, instead of individual pots and pans. Calphalon offers several set options in different price ranges. Just know that if the set says 17 pieces, the number includes pots, pans and lids, and some may even count the instruction booklet! Like all cookware, Calphalon needs care and attention to prevent the surface from scratching, thus exposing the aluminum underneath. While it’s difficult to do, there are ways to treat your pots and pans to assure the long life you’ve been told to expect. Now that the Calphalon Company has introduced stovetop and oven-proof cookware, and better yet, stove-to-oven cookware, they’ve improved their design to include heat-resistant handles and lids. To maintain the cookware’s stability, don’t use a scratchy cleaning sponge or abrasive. A gentle wipe with dishwashing soap should release any food residue. A soak in warm water may help you remove the difficult bits. And, Calphalon is now dishwasher-safe but should last longer if you hand-wash the pieces. 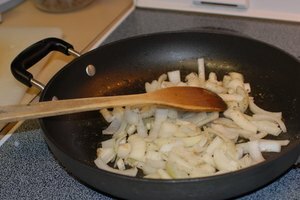 Recent additions to the cookware market are the products touting their contribution to “green living.” Made with environmentally safe technology in factories emitting little or no toxicity, these products, such as Green Pans and Xtrema Cookware, are ceramic based and non-stick, and they are made with no carcinogenic materials. Weil: Anxious About Anodized Aluminum?